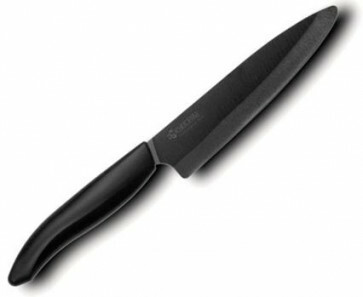 This black ceramic knife has blade lenght cm. 13. Ceramic knives are the ultimate cutting tools for everyday slicing of fruits, vegetables and boneless meats. The ergonomic handle provides for a comfortable and highly controlled grip. Ceramic is a pure and healthy alternative.Unlike steel knives, ceramic blades will not transfer metal ions to food, nor corrode from acids or oils in fruits and vegetables. Ceramic will never rust. At half the weight of and equivalent steel knife, a ceramic knife becomes a comfortable extention of the hand, reducing fatigue during long, repetitive cutting tasks.